The Crystal of the Day for Tuesday 19 November 2013 is Lepidocrocite. Lepidocrocite is a stone that often occurs in quartz, and is well known as one of the constituents of Super Seven, or “Melody’s Stone”. Lepidocrocite’s vibration works strongly within the thymus or higher heart chakra to encourage you to open your heart to Divine love. It has a soothing vibration that helps calm ADHD and hyperactivity, and its vibration may be helpful if you are working on healing the inner child. It surrounds you in a bubble of high-vibration golden light that is a barrier against negativity and has metaphysical properties that may align you with Divine will, as it aids you to release fear. Lepidocrocite’s energy helps you to make contact with angels and spirit guides when you use it in meditation. Its colour is reddish brown to a darker red, and this may vary, as it depends on what type of quartz it is included in. When this mineral is found within Amethyst Crystals its colour is commonly more purplish-red. It has a strong vibration that makes it a valuable ally to use. Stones from Brazil may be called Kokoshanite, and it is sometimes sold as Red Fire Quartz. This stone has a powerful energy that brings all aspects of your etheric body into alignment. It will aid you with developing your intuition and instinct and with opening up your telepathic abilities. It is a beautiful heart chakra and thymus chakra stone, and when found within quartz has the additional property of a powerful amplifying effect of its vibration. Although it works primarily within these two chakras, Lepidocrocite stimulates and aligns all of the chakras and deepens your intuition. It kindles love and harmony within the etheric body and has a strong healing action within the emotional body. It allows you to be able to contact the Divine mind directly and this may aid you to bring spiritual insights into your day to day life as well as aid you to deal with emotional problems. Its vibration is known to aid you to recognise your strengths and to watch the things that happen in your life without needing to judge the issues. It is an excellent stone for emotional healing and may heal romantic relationships through its loving energy. This strong psychic protection stone deepens intuition and will also assist you to heal any holes in the aura caused by drug or alcohol abuse. Lepidocrocite is said to heal the heart and lungs and will aid in oxygenating the cells. It is known to have an active influence to heal the liver and the reproductive area and helps prevent hormonal shifts. It is said to help to dissolve tumours and to encourage cellular regeneration.The action of this stone is powerful to help you to work through feelings of grief, or if you are suffering from depression. 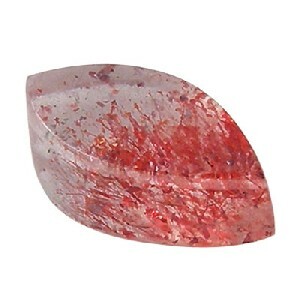 Lepidocrocite in Quartz is a strong meditation stone as it will benefit you by enhancing your ability to make contact with members of the angelic kingdom or your guides. If you have not previously made contact with your guides this stone will aid you to find your spirit guide, and start connecting with angels. Combine the beautiful Pink Petalite with it, as this combined vibration is powerful to aid you to contact your guardian angels and other spirit guides. 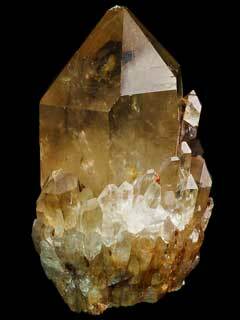 The Crystal of the Day for Monday 18 November 2013 is Kundalini Quartz. Kundalini awakening entails the kundalini energy moving up the spine from base to crown and is associated with the idea of ‘enlightenment’. It has been written about in literature for a long time. The process revolves around the concept that you have a kundalini serpent, that is said to reside at the base of your spine and is wrapped three and a half times around the sacrum, until it is roused. When this serpent rises up and makes its way to the crown, you are said to be enlightened. Be aware that many people have health issues from the awakening of their kundalini, so make sure that you educate yourself well before purposely performing any process to make this happen. Individuals vary, and although kundalini awakening may often happen spontaneously, it may take years of doing certain spiritual practises. Some of these are very special, in-depth practises, and by using specific crystals at the same time, it is possible to aid the process to awaken the kundalini serpent. If you desire to use crystals to do this, some of the best stones to use are Aurora Quartz or Serpentine Stone. Using these crystals as part of the process is very useful, as they are known to alleviate some of the possible discomfort that it is possible to feel. Using either Serpentine Stone or Aurora Quartz allows you to clear the chakras as the movement occurs. If you feel you want to participate in these practises please ensure that you take advice from extremely knowledgeable experts, as some people have been known to have bad side effects from doing this.